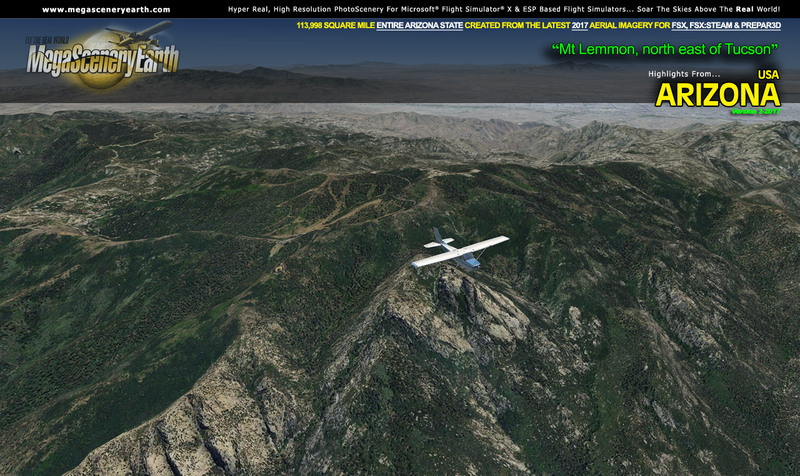 PC Aviator - The Flight Simulation Company! 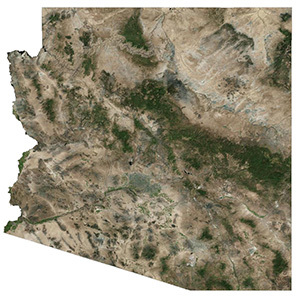 The entire state of Arizona at 1 meter per pixel resolution created from the latest up-to-date 2017 aerial imagery. 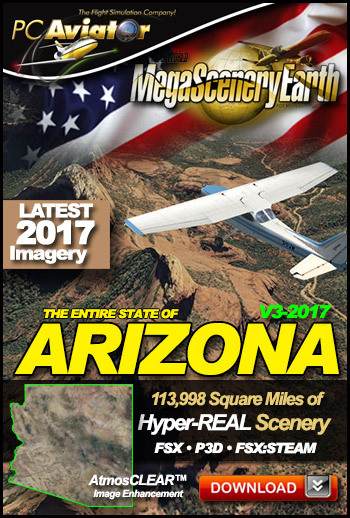 The New MegaSceneryEarth Arizona Version 3 - 2017 features unsurpassed image sharpness, scenery color and clarity, improved scenery features with accurate additional water bodies and topographical data and the latest completely-up-to-date aerial imagery available taken in 2017. 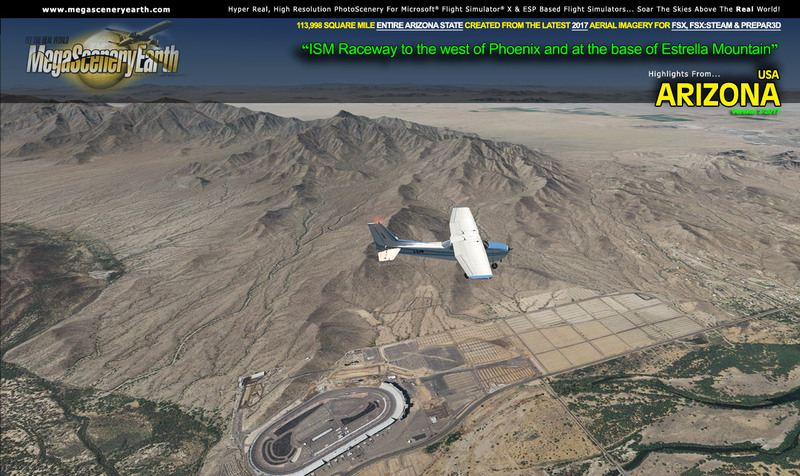 Fly the entire state - BORDER to BORDER - of Arizona in photoreal detail in 1 meter per pixel resolution throughout..
Arizona is the fifth largest state in the lower 48 at over 113,998 square miles in size and has 220 airports. You'll see everything that you see in Arizona in real life in the scenery. 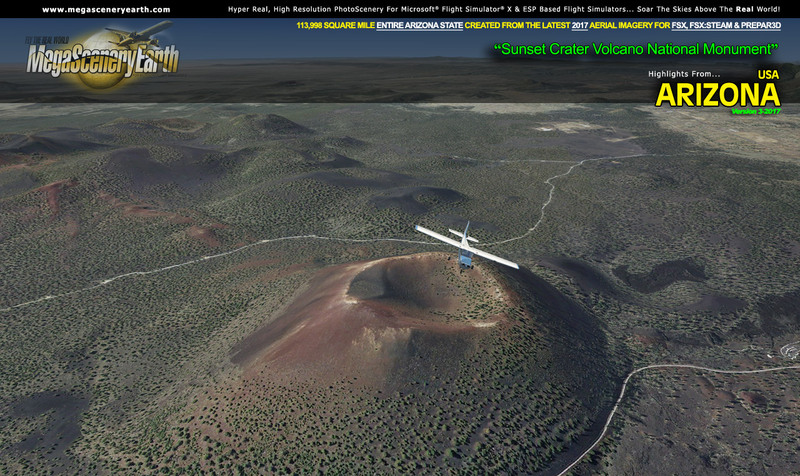 Arizona is a visually spectacular and fun place to fly with terrain that varies from towering mountain peaks above 12,500 feet, high plains, canyons, basins, mesas and deserts. This kind of terrain is where MegaSceneryEarth 3.0's high res graphics really shine. You'll be truly stunned by the scenery of Arizona. This title gives you the most spectacular natural feature in the entire country - The Grand Canyon - you get to fly the ENTIRE Grand Canyon in photoreal detail at 1 meter per pixel. 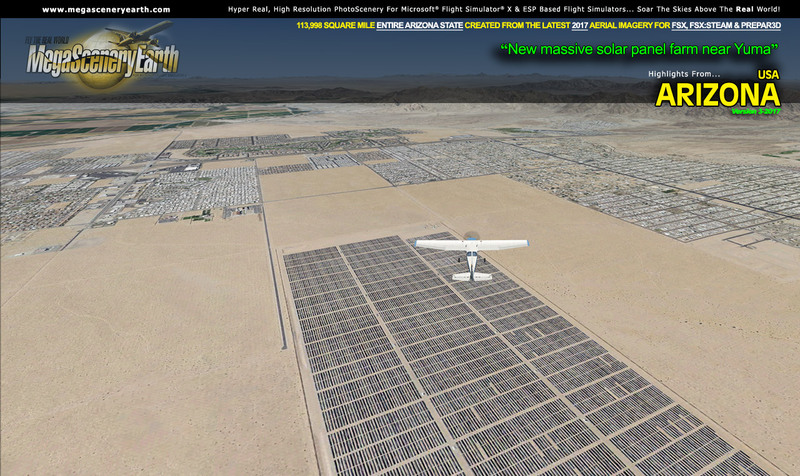 Arizona imagery is processed using our proprietary AtmosCLEAR™ image processing. AtmosCLEAR™ is a post production image processing technique that simulates the image being photographed in a vacuum to eliminate all atmospheric haze and artifact. It's clear of atmosphere. The result is a crystal clear mathematically optimally contrasted image. 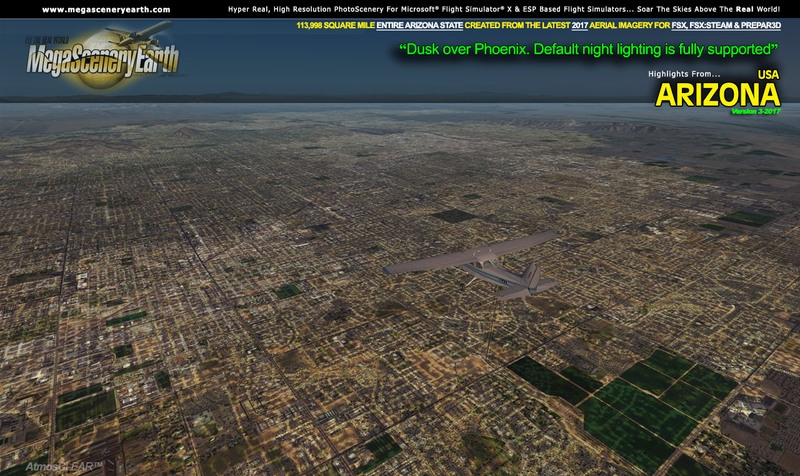 Arizona blends seamlessly with FSX and Prepar3D night scenery so that dawn and dusk feature a blend of aerial imagery and night lighting while the scenery transitions to full day or full night where all default FSX night scenery displays. 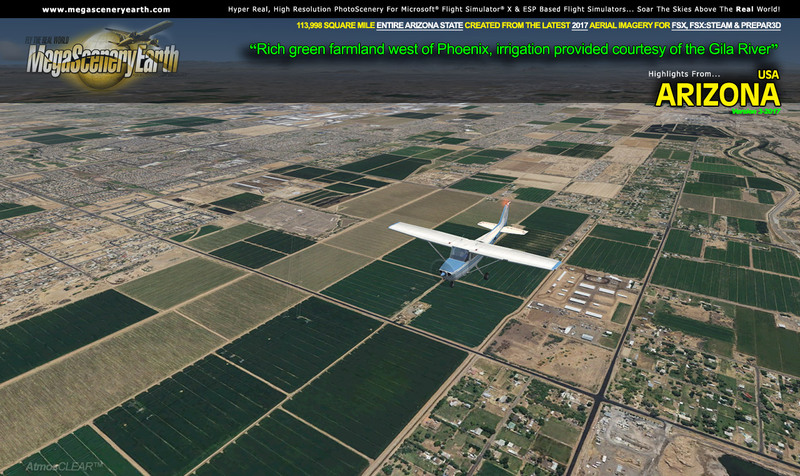 Arizona also features Flight Simulator water effects on all lakes, ponds and reservoirs greater than 3 acres from the national hydrographic database. If the water body is greater than 5 sq km, then its shorelines are hand etched pixel by pixel for highly accurate shorelines. Wide rivers also have hand etched shorelines and banks. The raw photographic water body is left untouched with the result being an authentic variety of different water colors that highlight specific properties e.g. mineral lakes whose color is maintained. Where possible water surface artifact is removed from the image. For users who like to see the water bodies as they are, then simply turn off the simulator water effects and you will see the native aerial images of the water bodies as you fly. Specific characteristics of narrower rivers require that we do not apply water effect to narrow rivers and creeks for a better scenery result. As an added bonus, we provide all the VFR and IFR charts in digital PDF format to enable you to get the most out of your scenery. This includes 3 Sectionals, 4 IFR enroute charts, and a 262 page book of Instrument Approach plates, Airport Diagrams, SIDs and STARs, and an Airport Facility Directory. The charts are downloadable along with your scenery files. 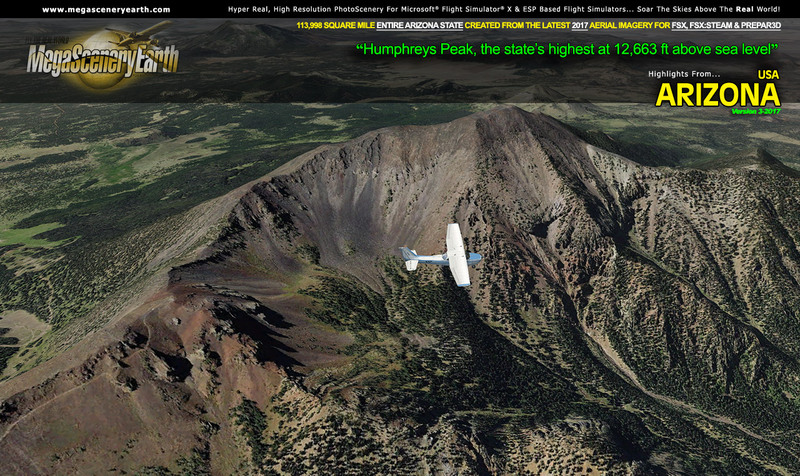 Mountains & Hills: Humphreys Peak (12,562 ft), Agassiz Peak, San Francisco Mountain. Fremont Peak, Aubineau Peak, Rees Peak and a total of 50 other peaks and mountains above 9,500 feet. State Parks & National Forests: Apache-Sitgreaves, Coconino, Coronado, Kaibab, Prescott and Tonto National Forests. This is a download edition with the option to order a DVD disk set (15 discs). 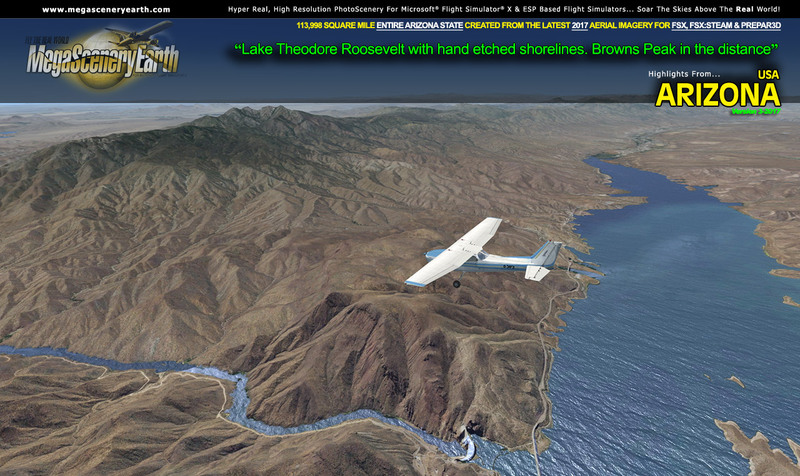 THIS TITLE COMES WITH A FULL SET OF FAA AERONAUTICAL CHARTS FOR Arizona IN PDF FORMAT. There is a free demo for this area available. See top of this page for a download link..